medals and—even worse—the president’s decision to hop on the bandwagon rather than show the country he has a firmer grasp on the issues than his adversaries do. ….With the president now on board, there’s a good chance Rubio’s idea will become law. In fiscal terms, the change will be minuscule. In terms of fairness, it seems like a strange slight to winners of other kinds of prizes. 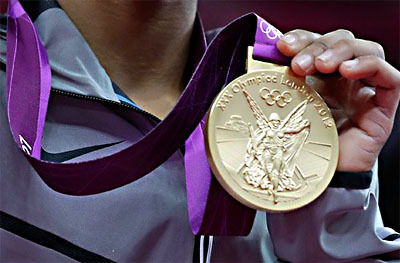 Are Olympic medalists worthier than winners of the Nobel or Pulitzer prizes? And of course exempting all prize income from income tax could merely encourage all kinds of people to restructure their income as prizes. The J.P. Morgan Memorial Prize for Achievement in Investment Banking, anyone? I knew about Rubio’s ridiculously panderific bill, but I didn’t know Obama had endorsed it. Aren’t election years great? And what luck for (summer) Olympians that they’re getting saturation TV coverage precisely 90 days ahead of an election framed largely around tax rates! The Nobel prize winners aren’t so lucky, but who knows? October isn’t so bad either. Maybe they can whomp up a nice PR campaign right around the time of the presidential debates. After all, Nobel prize winners have a much stronger claim to being “job creators” than a bunch of jocks.